Nott in 1723 added all sorts of fruit, spices, nuts and veggies to 10 crab recipes: dates, grapes, oranges, barberries, gooseberries, ginger, mace, cinnamon, fennel, artichoke bottoms, asparagus, almond paste, pistachios, pine nuts, fried parsley, raw or hard egg yolks, wine, vinegar and butter. 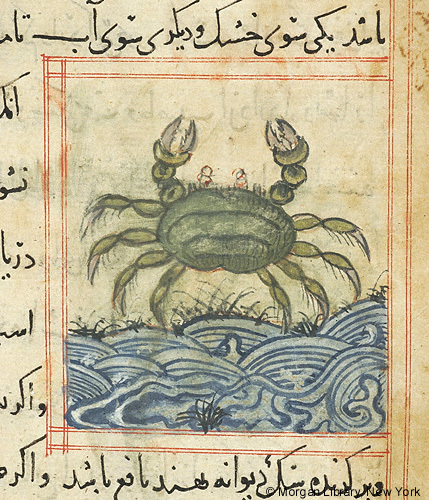 Two Medieval crabbe recipes simply boiled or baked the crab then served it cold with vinegar; or with cinnamon, sugar, vinegar and butter upon a chaffing dish. Take a crabbe or a lopster, and stop him in þe vente with on hire clees, and seth him in water, and no salt; or elles stoppe him in þe same maner, and cast him in an oven, and bake him, and serue him forth colde. And his sauce is vinegre. Two Fifteenth-Century Cookery-Books. Harleian MS. 279 & Harl. MS. 4016. First take awaie all the legges and heddes / and then take all the fisshe out of the shelle & make the shelle as clene as ye can and putte the meate in to a disshe and butter it upon a chafyng dishe of coles and putte there to sinamon and suger and a little vineger, and when ye have chafed it and seasoned it / then put the meate in the shelles again and bruse the heddes and set them upon the disshe side and serue it. Boil your Crabs in Water and Salt; beat Oil and Vinegar well together, lay your Crabs to steep in it; then lay them on a Gridiron over a gentle Fire; as they broil, baste them with Rosemary Branches: Serve them up with beaten Butter and Vinegar, or Oil and Vinegar, with the Rosemary Branches they were basted with. Boil your Crabs, take the Meat out of their Bodies, and strain it with the Yolks of three or four hard Eggs, Claret-wine, Vinegar, Sugar, and beaten Cinnamon; then put it into a Pipkin with fresh Butter, and let it stew for a quarter of an Hour; then serve them up as before. Boil your Crabs, take the Meat out of their Shells, and also out of their great Claws; cut it into Dice-work, and put both the Meats into a Pipkin with White-wine, the Juice of Oranges, Nutmeg, and Slices of Orange; let it have three or four Warms over the Fire; and having cleans’d the Shells well, put the Meat into them, and lay the Legs on the Dish round about them. 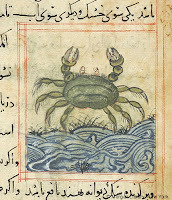 Boil a Crab, take the Meat out of the Shell, and mince the Claws with a fresh Eel; season it with Salt, cloves, Mace, and sweet Herbs shred small, mingle with the Yolks of Eggs, add Grapes, Goosberries or Barberries, and boil’d Artichokes in Dice-work, if in Season, or Asparagus boil’d; some Almond Paste, the Meat of the Body of the Crab, and some bread grated; fill the Shells with this Compound, and also make some of it into Balls, put them into a Dish with White-wine and Butter, and bake them in a gentle Oven; when they are bak’d put them into another Dish, and serve them up with beaten Butter, large Mace, scalded Grapes, Goosberries, or Barberries, Slices of Orange or Lemon, and the Yolks of raw Eggs dissolv’d in Claret or White-wine, and beat up thick with Butter, pour this on the Fish, garnish with Slices of Lemon, stick the Balls of farc’d Meat with Pistaches, slic’d Almonds, Pine Apple Seeds [pine nuts], or some pretty Cuts in Paste. First boil a large Crab, take the Meat out of the great Claws, flour and fry it; then take the Meat out of the Body, strain it, keep one half to be fry’d, and the other for the Sauce; mix that you fry with Almond Paste, grated Bread, Salt, Nutmeg, and the Yolks of Eggs, dip these first in Batter, and fry them in clarified Butter; then beat some Butter up thick with the Juice Orange and grated Nutmeg, put in the rest of the strained Meat, let this be your Sauce; dish your fry’d Meat, placing the Legs about it, run it over with beaten Butter, and lay fry’d Parsley about the Brim of the Dish. Take out all the Meat of the Body of the Crabs, break their Claws, mince the Meat, put it to Claret-wine, some shred Fennel, a grated Nutmeg, boil these together in drawn Butter, with Cinnamon, Ginger, and the Yolks of a couple of Eggs; then put the Meat into the Crab’s Shell, and garnish it round with the small Legs. To make a bath of Crabs. Boil a couple of Crabs, take the Meat out of the Claws, and cut it into square Pieces like Dice; mix it with the Meat of the Body; then put in Pineapple Seeds [pine nuts], Pistaches, or Artichoke Bottoms boil'd, blanch'd, and cut into square Pieces like Dice; or else some Asparagus boil'd, and cut half an Inch long; stew these all together in Claret, Vinegar, fresh Butter, Salt, grated Nutmeg, and Slices of Orange: When they are enough, dish them on Sippets, Cuts or Lozenges of Puff-Paste; garnish with Fritters of Armes [fritter batter on metal shapes], Slices of Lemon carv'd, Barberries, Gooseberries or Grapes; run them over with Butter beaten up thick with the Yolks of Eggs. Boil your Crabs, take the Meat out of the Shells and Claws as whole as you can. Season it lightly with Salt and Nutmeg, then strain the Meat that came out of the Bodies with a little Claret, Juice of Orange, Butter, Ginger, and Cinnamon; lay Butter in the Bottom of your Pye, &c. then lay in the Meat of the Claws, Pistaches, Asparagus, Bottoms of Artichokes, Yolks of hard Eggs, whole Mace, Grapes, Barberries, or Gooseberries, slic'd Orange, and Butter; close it up and bake it; when it comes out of the Oven, liquor it with the Meat out of the Bodies. TAKE half a dozen Crabs, boil them, and take the Meat out of the Shells; season it with Salt and Nutmeg ; then strain the Meat taken out of the Bodies. with Claret-wine, Cinnamon, some Ginger, Butter, and Juice of Orange; make your Pye, lay some Butter in the Bottom, lay in the Meat with Artichoke Bottoms, the Yolks of three or four hard Eggs minced, Asparagus, large Mace, Barberries, Grapes, Dates, Slices of Orange, and Butter. When it is baked, liquor it with some of the Meat out of the Bodies of the Crabs, mingled with Cream or drawn Butter. Boll them, take the Meat out of the Bodies, save the great Claws, and the small Legs whole to garnish the Dish, strain the Meat with Claret-wine, Vinegar, Salt, Nutmeg, and a Piece of Butter; put them into a Pipkin, and let them stew for an Hour, over a gentle Fire, ’till they are almost dry; then put in Butter, beaten up thick with the Juice of Oranges; dish the Shells being wash'd, lay the Claws and little Legs round about them; put the Meat into the Shells, and serve them.